Big and lumpy just isn't worth anything any more. Especially if it's a 92K Peugeot 605 3.0SVE automatic with 139,834 miles under its wheels. 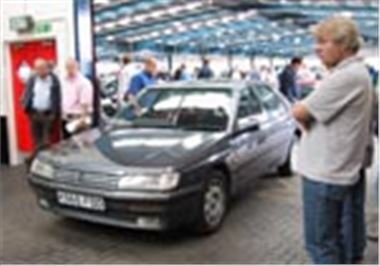 In a sale of part-exchanges at BCA Blackbushe today, bidding for the car in the photo opened at £200 and ended at £375. A 134,546 mile 94M didn't do much better. This one was a manual 2.0SRTi with slightly less scary fuel consumption but bids still hit the wall at £750. Insurance hikes ensured that bidding for an ex Kent police 145,324 mile 98R Volvo V70 T5 manual ran out of steam at £3,500. Same age, same mileage would have reached £1,000 more a year ago. Elsewhere, at the other end of the economy spectrum, it was battle of the Ibiza TDIs. The blue 60,000 mile 98R Salsa mentioned last week reappeared and staggered into the hall on a well worn space-saver and flat rear tyre. The bidding unwisely took it to a still provisional £3,175. But this time round it had competition from another, brighter 98R 41,000 mile example in metallic bottle green with alloys, needing no money spent, but without a sunroof. Bidding was strong, it sold slightly over book for £4,000 and was obviously a far better buy than the doggy blue one. A thoroughly sensible 20,000 mile 99V Corolla 1.6GS 5-door with three stamps in its service book sold for a sensible six grand. In comparison, a 58,000 mile 99T Focus 1.8CL TD sold for £6,600, which wasn't sensible at all. Star of the sale was an 18,000 mile 2000X VW Bora Sport TDI 115, in silver, with six speeds in its box. Despite a lot of surface scratches to the lacquer coat, bidding for this was enthusiastic but the £13,500 it reached wasn't quite enough. To subscribe to BCA Auctionview, giving composite prices achieved and details of cars in upcoming BCA auctions, visit www.bca-auctions.co.uk Full list of auction centres throughout the country at www.honestjohn.co.uk (go back to the home-page and click on auction directory).